After the Makah Tribe lost its last first-language speaker in the early 2000s, Monette began to study linguistics in high school, which he continued at Dartmouth, his mother Rebekah Monette said. On April 2, Monette was reported missing after he was swept off the rocks by a wave near the Hole in the Wall cove in Cape Flattery, close to his home in Neah Bay, Washington. Searches for him were suspended on April 4. He was 19. Monette was a member of the Native Americans at Dartmouth student organization and planned to pursue a degree in linguistics. Justeen Komok ’19, who is also from Washington, first met Monette at the airport before First-Year Trips because they were on the same section. They began a romantic relationship during freshman pre-orientation and remained together for almost the entirety of their freshman year. Komok said that because he was so far away from home, Monette tried to bring his culture and traditions to campus through different projects, including crafting tiny sealskin moccasins for his newborn nephew and drums for his little sisters. In the jewelry studio, he made a toggle for a harpoon. “He actually produced from start to finish his own toggles, and he was so proud of it, and he was giving them to his family members to be actually used out on the water at home,” Komok said. In addition, Monette had his father ship him sealskin so that he could sew his own moccasins, Komok said. She added that Monette worked with another student who knew how to sew canvas, and together they tried to determine the best way to sew together the sealskin. Eleni Mora ’18, Monette’s First-Year Trip leader for Hiking 3, said she was inspired by Monette’s personal engagement with the practices of his culture. Michelle Wang ’19, one of Monette’s trippees, said that Monette was very supportive during their trip. Due to an injured ankle, Wang would frequently fall behind the other members of her trip, but Monette would draw back and entertain her with stories about him and his hometown to keep her company. Wang said she was inspired by Monette’s goal to revitalize the Makah language. At one point during their trip, Monette spent two hours describing to everyone how to skin and parse a seal and explaining what each part can be used for, Wang said. Monette’s aunt Rachel Venske said that Monette would often go on hunting expeditions with her son, his cousin Abraham, who was close in age to Monette. “He’s been on different hunting adventures, seafood-gathering adventures, with his different cousins, with his friends, with his mom,” Venske said. Monette also had a curious mind and a thirst for knowledge, Rebekah Monette said. “He had a mind that was constantly in motion, and he was always thinking about something, contemplating something, from the time that he was very, very young,” she said. Monette was initially interested in pursuing degrees in biology and law but refocused his energies on reviving the Makah language when he learned about how the language “holds so much of [his people’s] view of the world through the Makah lens,” Rebekah Monette said. She explained that Monette’s interest in the language came from language classes and from her own work at the Makah Cultural and Research Center in Neah Bay. While attending Dartmouth, Monette was very focused on linguistics, even though it was not his strongest subject, she said. Venske echoed a similar sentiment. “Family was everything for [Monette],” Venske said. She added that their family often has big gatherings — this past Thanksgiving she hosted 93 guests at her home. His mother said that Monette was very enthusiastic about adopting his two younger sisters. She added that Monette also looked up to his older brother, Eli Monette, and had been looking forward to being an uncle to his 7-month old nephew as he got older. Monette also spent a lot of time with his grandfather, learning and “investing in that knowledge base from the older times,” Rebekah Monette said. She said that though her son was not very big in size, he accumulated 174 football tackles in his senior year of high school. Monette was a member of the Neah Bay High School Red Devils, a three-time state championship team. In 2016, the Neah Bay High School basketball and football teams won the State Championships and were invited to the state capital. Monette performed at the event in March 2017 as the lead singer in the Appreciation Song in front of Washington Gov. Jay Inslee and his staff. When he was around 15 years old, Monette began singing for the culture program at the annual summertime Makah Days, a fair commemorating the Makah Tribe, his mother said. Monette also had a deep love of nature, according to Mora. According to Mora, Wang and Welzbacker, Monette was a kind and caring individual. Welzbacker first met Monette when she was around 9 years old. They were both participating in the All-American Soap Box Derby and were competing against each other, she said. “His mom told him to blow me a kiss to distract me, and little 10-year old Josh did and I ended up losing the race,” Welzbacker said. Monette and Welzbacker both attended Klahowya Secondary School for two years in Silverdale, Washington, before Monette moved to Neah Bay. However, they continued to stay in touch and became best friends. Welzbacker said that in the past year and a half, her high school lost two students, and Monette came to both memorials. According to her, for one of the memorials, Monette paid for his flight from Dartmouth out of his own pocket “because he felt like he needed to be there,” even though he had not attended the school since eighth grade. According to his mother, Dartmouth was not initially on Monette’s list of potential schools. 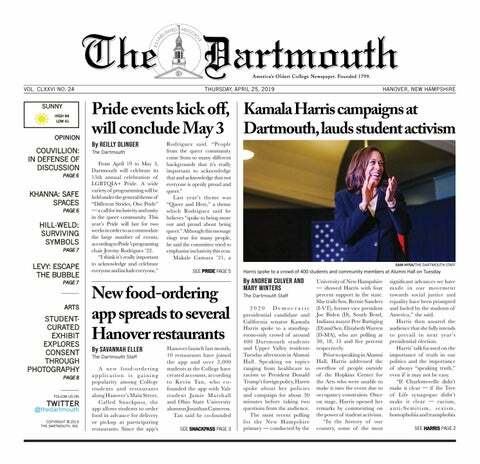 However, after he visited the campus several times, he was attracted by the Native American community at Dartmouth, she said. “If he was going to have to be away for school, I think he wanted to remain in a place that would still allow him to maintain his identity,” she said. She explained that Monette saw Dartmouth as a gateway for future career opportunities. Monette touched many lives on Dartmouth’s campus, and even if it was a short conversation, he was very memorable, Komok said. Welzbacker said that Monette intended to return to Neah Bay after graduation and become a linguistics teacher. On April 9, more than 800 people attended Monette’s celebration of life in his hometown of Neah Bay, Venske said, adding that from a young age, Monette blessed the people around him with many memories. Rebekah Monette said that during Monette’s celebration of life, she saw many sincere friendships her son was able to forge. Monette is survived by his mother, father, stepfather, older brother, two younger sisters, nephew and a large extended family. A ceremony honoring Monette's life will be held on May 8 at 5 p.m. in Rollins Chapel, followed by a reception at the Top of the Hop.